Split pea soup with ham is an easy recipe that makes the best use of your leftover holiday ham bone. 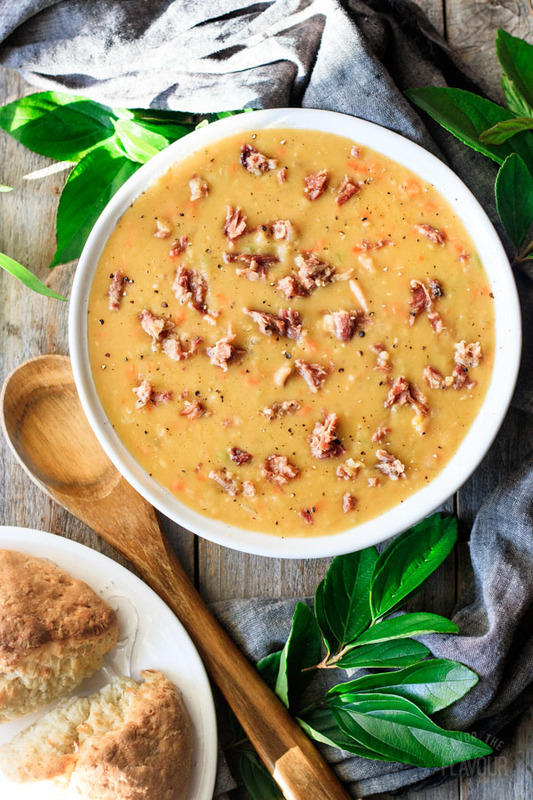 Cook this freezer friendly homemade soup on the stovetop or in the crockpot. Make a big batch of this cold weather comfort food for your family to enjoy! 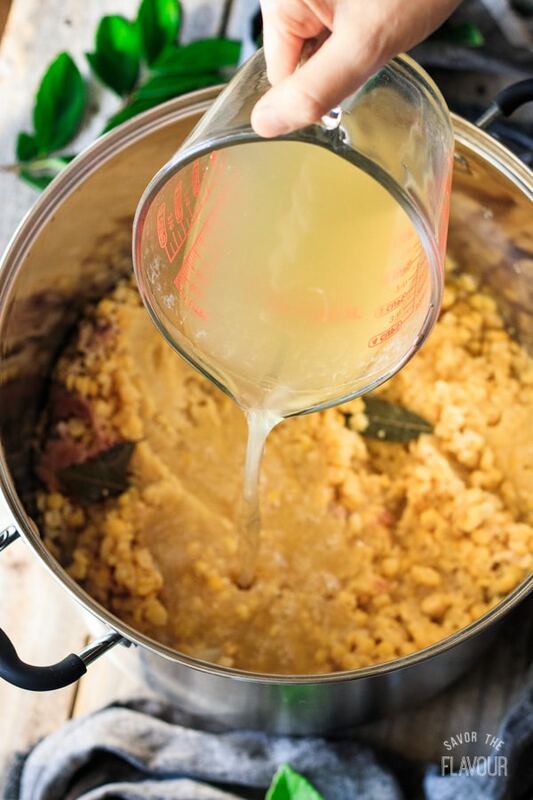 Yellow split pea soup is my girls’ favorite homemade soup, so they are always pleased to hear that it’s on the menu. I love it just as much as they do because this soup is so comforting to eat on a cold day. Plus, it’s filled with protein and fiber! It’s also low fat and diabetic friendly as split peas are a low glycemic food. 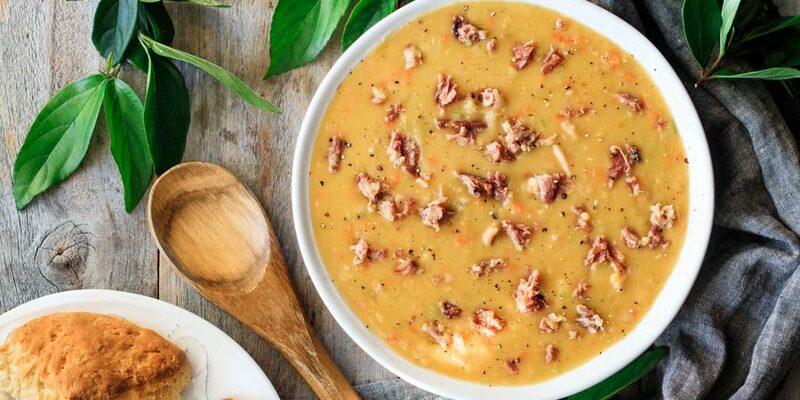 Is homemade split pea soup healthy? Yes, it most definitely is! Read our nutrition label after the recipe to get all the facts. High in dietary fiber: helps keep you full and can eliminate cholesterol in your blood. High in vitamin K: helps trigger blood clot formation to protect you from blood loss from a wound. High in potassium: helps support your metabolism, regulate your blood pressure, and improves your nervous system. High in magnesium: helps with proper muscle function and blood pressure control. High in iron: helps promote healthy red blood cells. Lower in sodium: reduce sodium by using no salt chicken broth and adding only the salt you need. 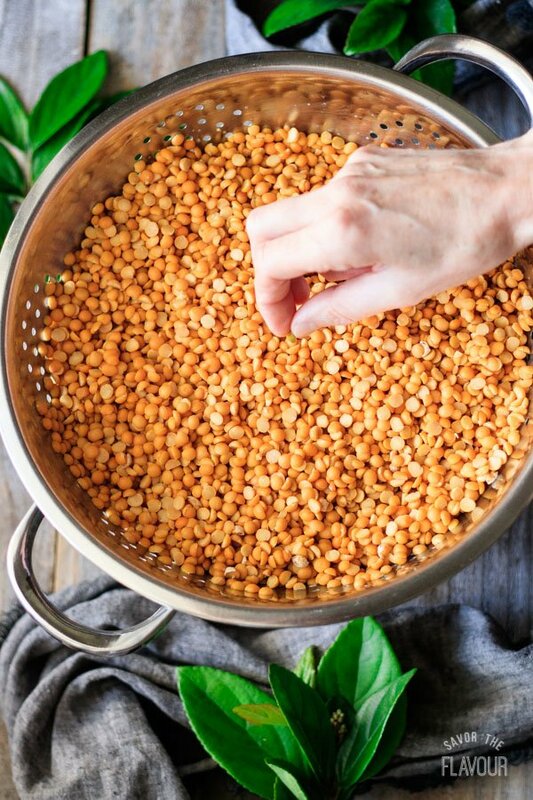 Do you need to pre-soak split peas for soup? No, you don’t need to pre-soak or parboil the peas. Just make sure your pot of soup is simmering for 1 1/2 hours. If you decide to pre-soak the split peas, it will reduce the cooking time for the soup by half. Don’t use split peas that are very old and dried out as they won’t cook as well. If you are at a high altitude, you’ll need to increase the chicken stock. If you choose to use any water to thin your soup, don’t use hard water as the minerals can stop the peas from softening. 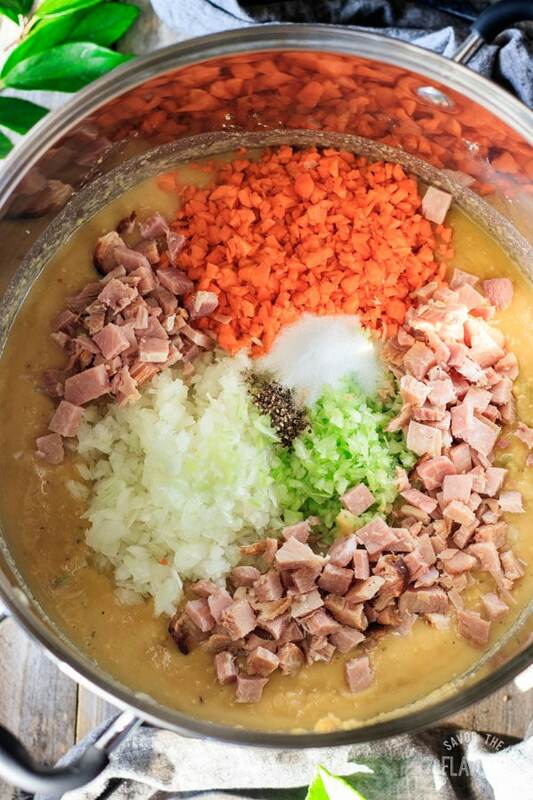 How do you thicken split pea soup? Cook with the lid off, so the extra liquid evaporates. Puree half of the soup, add it back to the pot, and stir. Add more rinsed dried spit peas, but give plenty of time for them to cook. Make a slurry of cornstarch to water or chicken stock (1:3 ratio). Can I make split pea soup in the crock pot? Reduce the ingredients for this recipe by half. Put all the ingredients, except the quartered onion, in a large crockpot and stir. Nestle in the ham bone. Cover and cook on high for 5 hours or on low for 10 hours. During the last hour of cooking, remove the ham bone and let cool. Shred the meat from the bone and put it in the pot. Pick out any green peas, then rinse. Place the peas and chicken stock in a large pot along with the spices (marjoram, bay leaves, salt and pepper). Put in a quartered onion and a meaty ham bone. Cover and bring to a boil, then reduce the heat and simmer for an hour. 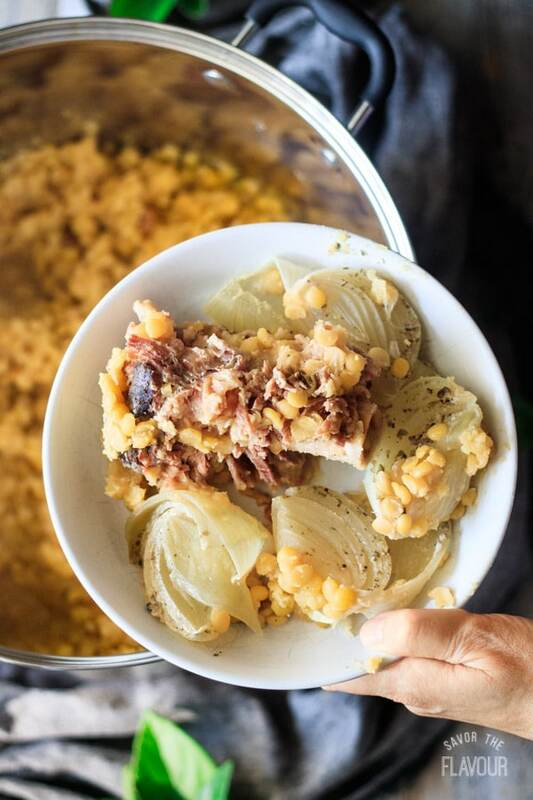 Remove the meaty ham bone and discard the quartered onion. Pour in the last 3 cups of chicken stock. Stir in the chopped onion, carrots, celery, chopped ham, and a little bit more salt and pepper, then cover and simmer for 30 minutes. After 15 minutes of simmering, taste the soup. Adjust seasonings if desired. Stir then cover and simmer 15 minutes more. 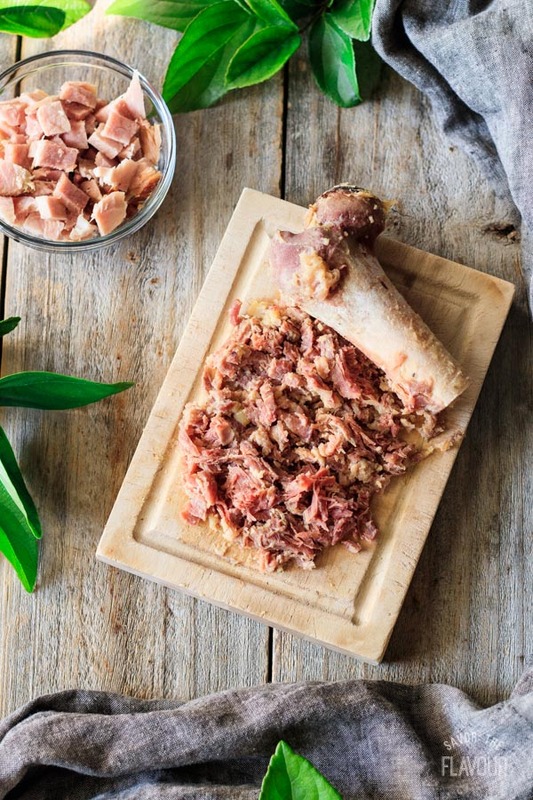 Once the meaty ham bone has cooled, cut off the meat and finely chop it. Add half of it to the soup and reserve the rest for garnish. Remove the bay leaves and garnish with chopped ham, parsley or green onion. Serve hot with some buttered crusty white bread. Enjoy! Don’t have a ham bone? Use 2 ham hocks or 2 cups of cubed country ham. Get a smoky taste by adding smoked paprika, liquid smoke, or smoked portabella mushrooms. Need this vegetarian? Replace meat with other smoky taste options and use vegetable stock. Don’t like the color? Use half green peas and half yellow split peas. Want it sweeter? Add parsnips or additional carrots. Need the soup thinner? Add more stock or unfiltered water. Want a smoother texture? Use a blender in batches, immersion blender, or potato masher. Need to cool your soup quickly for freezing? Put the soup pot in an ice bath in your kitchen sink. Want other garnish options? Try crumbled bacon, croutons, sour cream, fresh thyme leaves, or green onions. 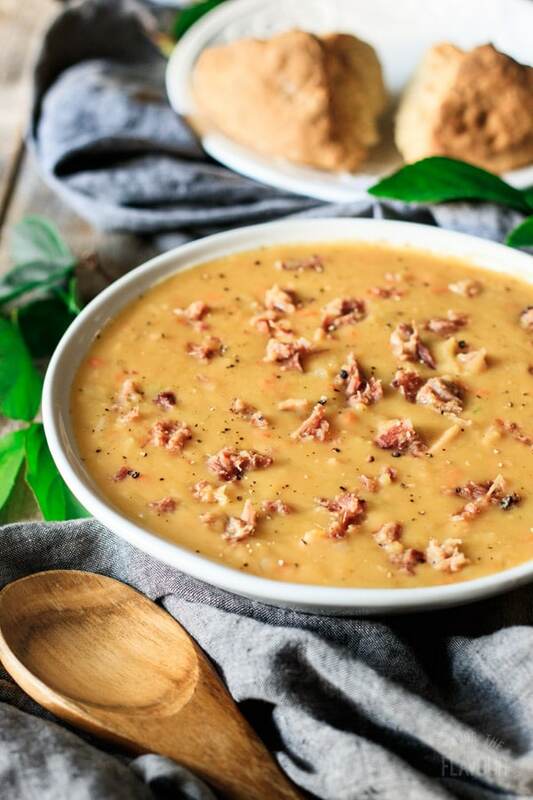 This split pea soup tastes amazing when served with one of our crusty white bread recipes like our easy white mountain bread. The soup above is pictured with our Irish boxty bread. 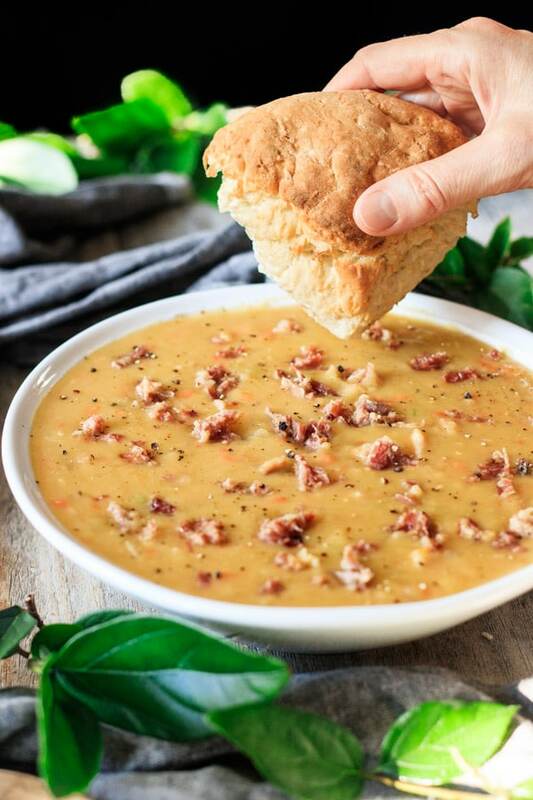 Just break off a chunk and scoop up some yummy soup. 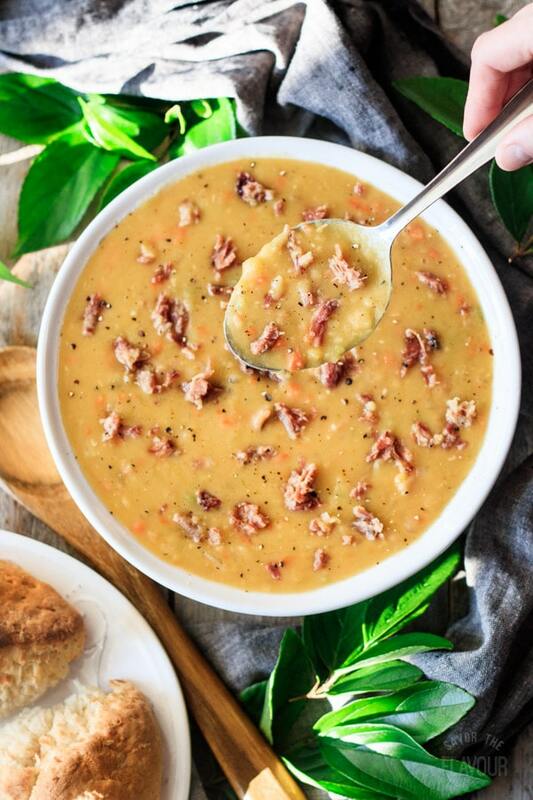 These other ham soup recipes will have you coming back for another bowl. 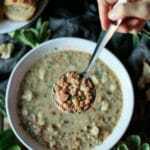 Leftover Ham and Bean Soup: mixed beans and ham are cooked in a flavorful broth. Smoky Cheese, Potato, and Ham Soup: this creamy soup has delectable hints of smoked Gouda. 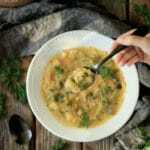 Dill Pickle Soup: a creamy Polish soup made with tangy dill pickles and potatoes. 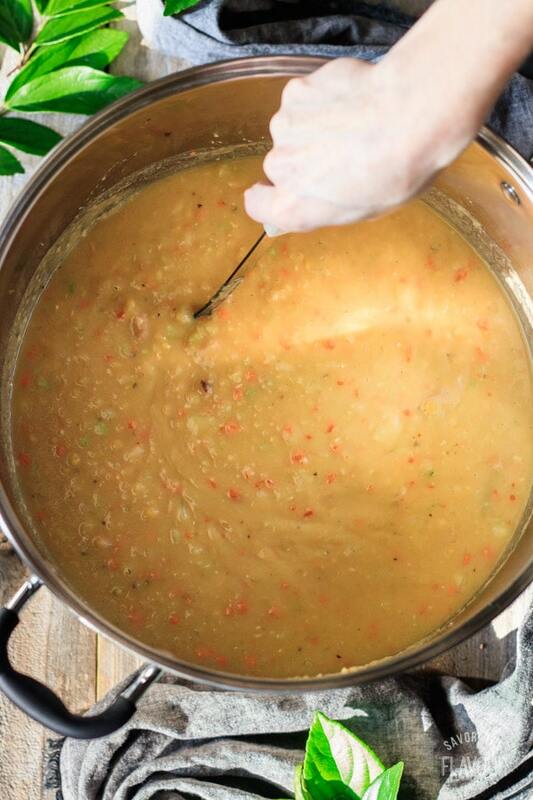 Did you make this split pea soup? Please leave a star rating below the recipe to share how you enjoyed it. 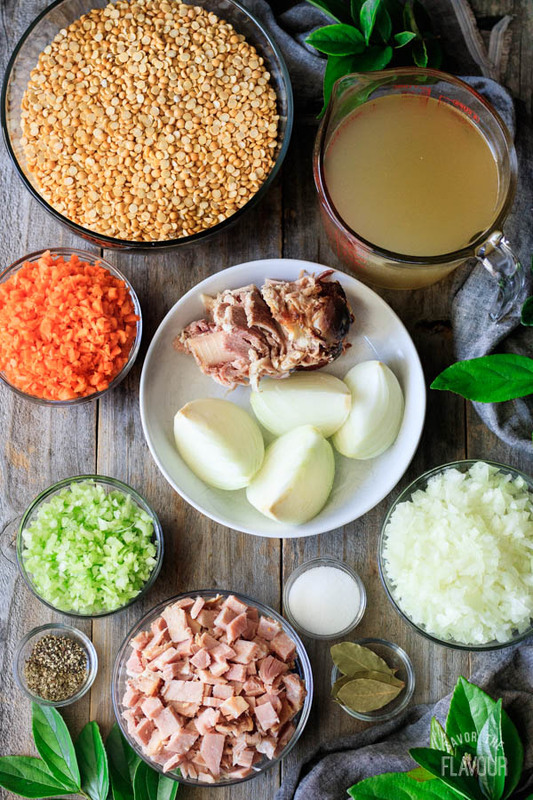 Place the peas, 12 cups of chicken stock, the quartered onion, bay leaves, marjoram, salt, and black pepper in a very large pot. Nestle in the meaty ham bone, then cover and bring to a boil (roughly 15 minutes) then reduce the heat to medium low and simmer for an hour, stirring occasionally. While the soup is simmering, use a food processor to chop up the carrots, celery, and onion. 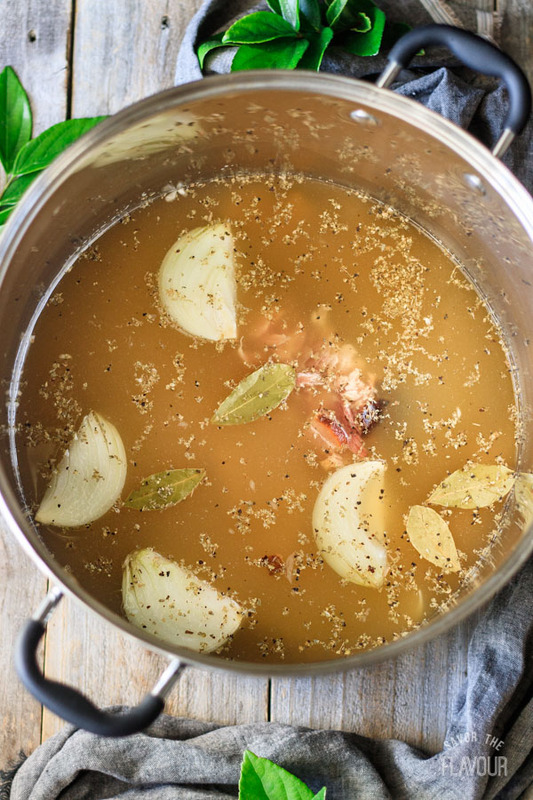 After an hour of simmering, remove the ham bone from the soup and place on a plate. Discard the quartered onion. When the ham bone has cooled, cut off the meat and finely chop it. Add most of the ham to the pot, but reserve some for garnish. Taste and adjust the salt or black pepper as desired. Discard bay leaves before serving. Garnish with finely chopped ham, parsley or green onion. Serve hot with fresh crusty bread. Cover and cook on high for 5 hours, or on low for 10 hours. During the last hour of cooking, remove the ham bone and let cool. Shred the meat from the bone and put half of it in the pot. Reserve the other half for garnish. Garnish with chopped ham, parsley or green onions. 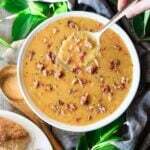 Store this soup in an airtight container in the fridge for up to 4 days, or freeze it in an airtight container or zip top freezer bag for up to 3 months.